Summer is the height of camping season, with lazy afternoons on the lake and fireflies sparkling in the dark. Fall is the time for woodsmoke and mugs of hot chocolate and stargazing on a cold, clear night. Whatever the time of year, why not celebrate the wonders of camping with your next Poetry Teatime? Whether you’re snuggled up indoors or out in the fresh air, get ready to dig into these camping-themed books, treats, and activities! Before we set the scene for our camping themed teatime, let’s take some deep breaths and soak in some atmosphere. We’ll start by exploring the forest with this wonderful poem by Lucy Maud Montgomery, the author of the Anne of Green Gables series. We’ll be following this forest path to set up our camping teatime today! So let’s get started. The best possible way to enjoy a camping themed Poetry Teatime is to go camping! If you can, grab the tent, some sleeping bags, and a load of firewood and go on a trip before the weather gets too cold. Now, of course, the weather may be cold and forbidding but you may still want to try a camping-themed teatime! We’ve provided lots of suggestions for ways to set up camp inside your own living room, from the cozy comfort of your home! Build a fire: This is one of the essential ingredients to enjoying life outdoors. Make sure you practice fire safety by clearing a safe space around the fire and by having water on hand to put it out. Set up camp: Whether you’re camping or not, “setting up” a tent or picnic area will help set the scene. If you don’t have a tent, you can string a clothesline between trees and throw a sheet over it for a makeshift tent. Try using picnic blankets and plenty of pillows on the ground, too. Bundle up: Make sure you’re equipped with the right layers so you don’t get cold, especially if you’re stargazing! Always bring more layers than you think you’ll need. Even if you’re in your backyard, it’ll save trips back to the house and a lot of complaints! Candles: One of the coziest ways to set the stage indoors is with candles. If you’re really patient, you can even try making s’mores over your candle fires! Just don’t leave your candles unattended. Play a campfire YouTube video: Did you know that there are lots of videos of campfires online, complete with the sounds of crackling logs? It’s amazing how cozy the room can seem with a video of a campfire on your TV or computer screen! Blanket fort: Just because you’re inside doesn’t mean you have to sit around a table! Why not set up a “tent” or a blanket fort in your living room? Pile up some blankets and pillows and use sheets overhead to get that atmosphere. Be careful if you’re using real candles around your blanket fort! Signposts, branches, and leaves: Although you aren’t actually outdoors, you can bring a taste of the forest inside with you! Make cardboard signposts pointing to your “camp” and other important locations (like the “outhouse” or the “canteen”). If it’s been dry lately, you can also go on a nature walk and collect branches, leaves, and other objects to set the scene! Once you’ve got your campsite set up, it’s time to dig into some tasty campfire treats! Campfire cooking: One of the best parts of camping is making all sorts of campfire goodies. Check out this recipe from Cooking with Janica for campfire pizza nachos, and these recipes for campfire cones from Hip2Save and orange brownies from RVC Outdoor Destinations. For even more ideas, check out this list of campfire recipes collected by Just Short of Crazy. Hot cocoa and hot apple cider: Stock up on seasonal hot drinks for today’s teatime. For an easy campside drink, make sure to bring powdered packets and heat up some hot water in the morning or evening for everyone to enjoy! All about s’mores: There’s only one thing you really must have at your camping themed teatime, and that’s some fresh hot s’mores. So be sure to stock up on marshmallows, graham crackers, and chocolates for this classic campfire treat! If you’re indoors, you can slowly “roast” marshmallows over candles or even a toaster. “Mud puddles” chocolate milk: Want to drink mud in today’s teatime? Well then, it’s your lucky day! All you need are some chocolate milk and funny labels to put on the cups. Dirt pudding: Yet another easy dirt-themed option for your camping experience is dirt pudding. You’ll need some chocolate pudding, whipped topping, oreos, and gummy worms for that extra touch. Find full directions here from Oh Nuts. There are all sorts of fun activities to do in the great outdoors. 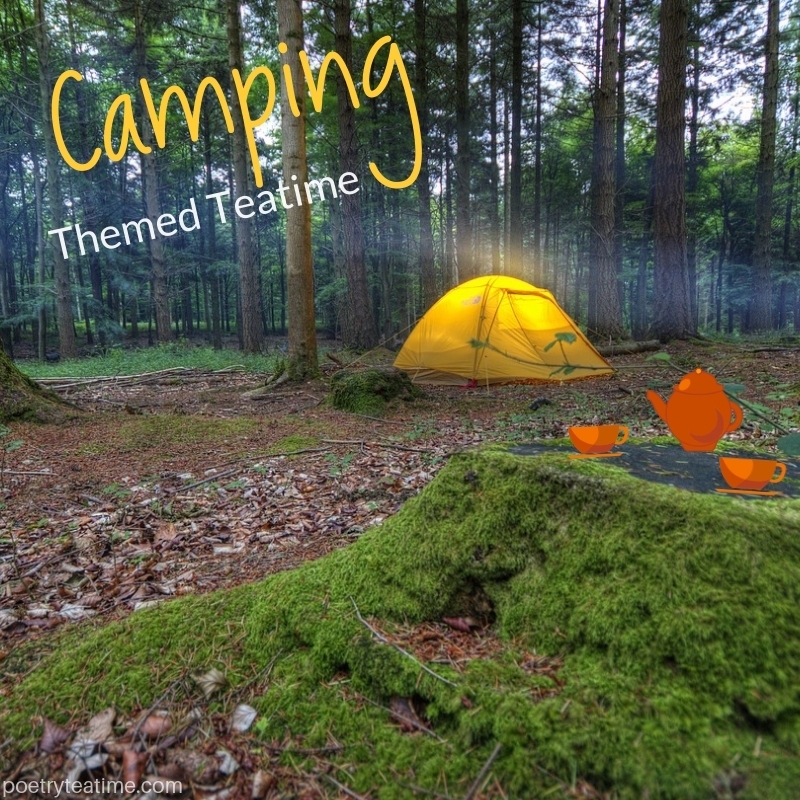 Here are some suggestions for enjoying your camping-themed teatime! Go on a nature walk: One of the best things to do outside is to go on a nature walk! Walk slowly and quietly and see if you spot any birds and animals. You can also go on a scavenger hunt to collect fun-looking objects or leaves! Draw and journal: Keep track of things that catch your eye, from the glimpse of a bird to the smell of campfire food. Record them in your notebook. 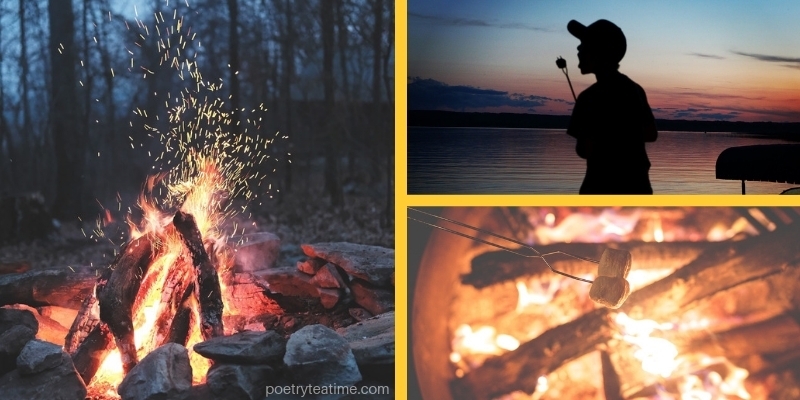 Plus, check out our prompt on summer camping and write your own camping-themed poetry! Make constellation tin can lanterns: Making constellation cans is a classic camp craft. Check out directions on how to make your own lanterns here from There’s Just One Mommy! Make firefly jars: Another easy activity is making glow-in-the-dark “firefly” jars using mason jars and paint! Follow these directions from Creative Me Inspired You. Stargaze: Lanterns are great, but nothing beats the real thing! If you can, take a look at some stars this evening. You can even make up stories or try to spot patterns in the stars. Play campfire games: Whether you’re indoors or out, you can tell stories, sing songs, and play some classic campfire games! Check out this list of easy games from 123Homeschool4Me! There are so many ways to enjoy being out in nature! So be sure to breathe deep and enjoy your camping themed Poetry Teatime.